Because we take being a "safe for life" shelter very seriously, each cat who comes into our care is guaranteed sanctuary with us if they are not adopted. Many cats whom we have rescued with extensive medical issues, seniors, or simply ones who have been passed over for whatever reason have remained in our shelter and become "sanctuary cats", meaning that they will never be adopted and have a home with us until they become too old or ill to have a quality life. It is then and only then that our staff and veterinarian make the decision to put a cat to sleep - to end suffering. We promise each cat who comes to us the right to live out their days in comfort, health, and happiness here, and we take that promise very seriously. Of course, the care of these cats is expensive and the expense grows as the cats age or need specialized care. Sponsors help us plan for the future and improve the lives of our resident kitties. Many of our sanctuary cats are requiring dental work in their golden years. Please consider sponsoring a sanctuary cat. TODD aka Taawwd is looking for SPONSORS! Todd is a senior sanctuary cat, around 17 years old. When Todd arrived at Catman2, we discovered that he had not been given proper veterinary care and had a bad infection that almost cost him his life. We fought to pull this old toothless boy through and fell head over heels in love with him in the process. Todd is a Devon Rex mix and is a very poor representation of the breed – to put it bluntly, Todd’s kinda ugly. But that is what makes him SO CUTE! He is PURRFECT to all of us and he is our absolute favorite cat. 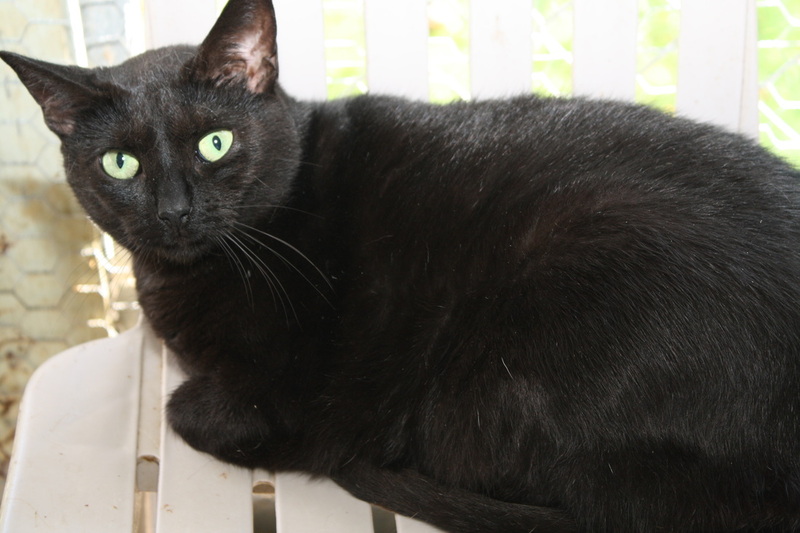 However, Todd is a sanctuary cat, which means that he will live out his life in the loving care of our shelter without becoming available for adoption. You can sponsor Todd’s care for a month, six months, or a year! DREW is looking for SPONSORS! Drew is a senior sanctuary cat who is around 16 years old. Drew’s person moved without him and brought him to us. During his time with us, he has had a lot of dental work. We have had to remove all but two of Drew’s teeth! He definitely feels better now! Drew has the most exquisite long face with one blue eye and one yellow eye that seem to stare right into your soul. He is an amazing, sweet old dude with some medical issues. You can sponsor Drew’s care for a month, six months, or a year! ZELDA is a young adult who is terribly shy and had neurological complications after an emergency C-section to save her from a life-threatening complication while trying to give birth. All of her kittens died except one. 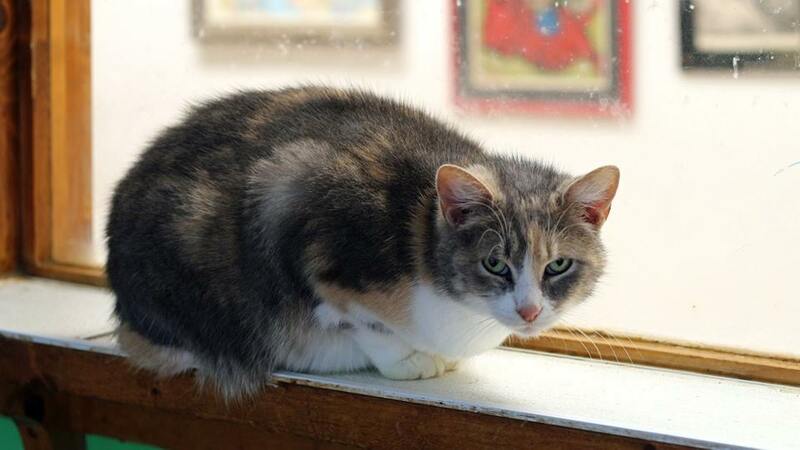 She no longer has issues with her bowels but she is very, very shy and is not likely to be adopted. You can be Zelda's angel and sponsor her for one month, six months, or a year! CASSIE MAE is a senior gal who was pulled from our local animal shelter a decade ago and was never adopted. She is a sweet girl but is shy and suffers from chronic ear infections and flea allergies (for which she wears a Seresto collar). We love our Cassie Mae. She is safe with us. You can be Cassie Mae's angel and sponsor her for a month, six months, or a year! ALLISON is a timid former mama cat from kitten season of 2013. She helped raise 8 babies with her 2 sisters, who were all adopted but the moms ended up staying due to their skittish behavior. You could be Allison's angel by sponsoring her care for one month, six months, or a whole year! CREAMSICKLE has aged with us since his arrival as a stray in 2010. He is a sweet old fellow who sometimes potties outside the box. He has a best buddy/girlfriend named Matilda who is much younger and less social than he is and they cuddle together all the time. You can be Creamy McDreamy's angel by sponsoring his care for a month, six months, or a full year! MATILDA has been with us since she was an older feral kitten. She never really tamed down so she is very anxious and scared of people. She loves other cats and has a best friend/boyfriend Creamsickle who is much older and more social. She cuddles with him most of the day. You can be Matilda's angel and sponsor her for one month, six months, or a full year! 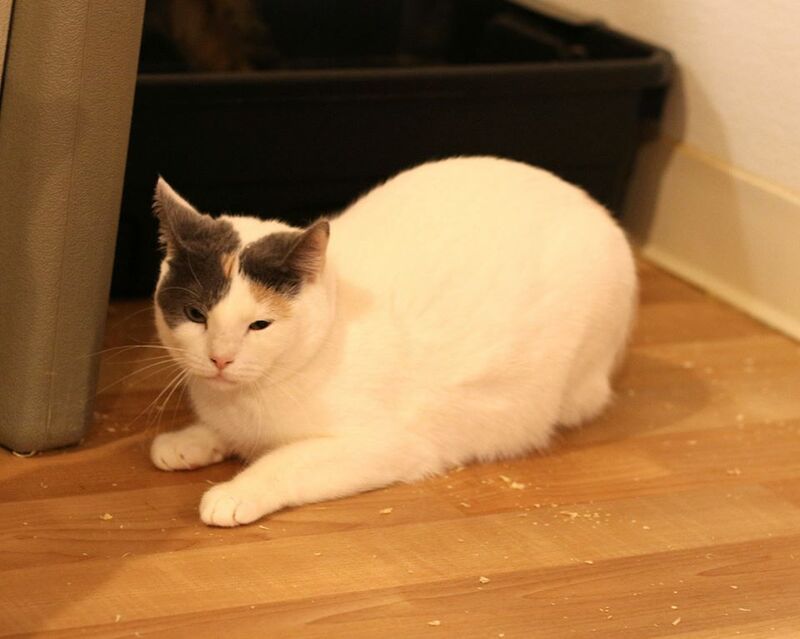 RHIANNON is a sweetheart of a cat but has Irritable bowel disease and has problems with making it to the box. She currently gets steroid shots regularly. You could be Rhiannon's angel and sponsor her for one month, six months, or a whole year! KIRA was a semi-feral cat who was living in a bank parking lot. She had been hit by a car and was walking around with a broken leg and pelvis. Catman2 came to the rescue, paying for her expensive surgery to repair her leg and nursing her back to health for months. Unfortunately, she is still pretty fearful of most people; while she would probably warm up to the right, very patient person, that person has not shown up for a few years :(. But, Kira is safe with us and that's all that matters. You can be Kira's angel by sponsoring her for one month, six months, or one year! 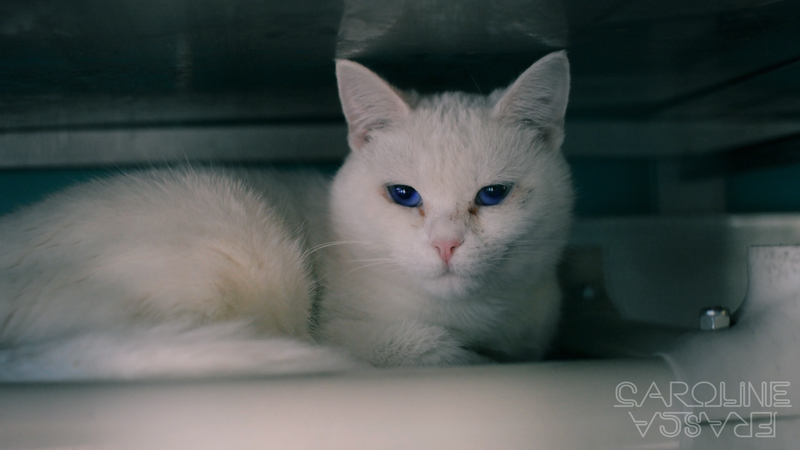 LIZ TAYLOR is a beautiful blue-eyed white cat who found herself with two newborns at the animal shelter with 10 other cats from her former home. Since the shelter was not able to handle such a big intake (and the other cats were very sick), we took Mama Liz and her babies to make sure they would stay safe and healthy. Her kittens were adopted but Liz has never been a very social cat. "Semi-feral" is a good description. With time and patience, she could become a more social cat but no one has been willing to provide her that. So, until then, Liz Taylor will stay in our kitten room and provide motherly love to kittens who wait for adoption. You could be Liz Taylor's angel and sponsor her care for a month, six months, or a year! 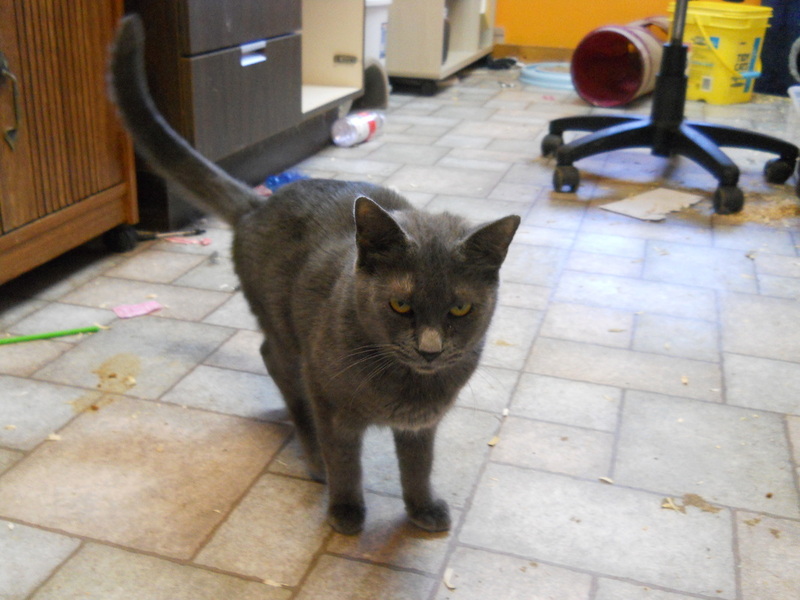 SWEETIE PIE is a sweet, cuddly cat who unfortunately just looooooves to spray! He's an excellent cat but this quality is not endearing to most people! We love Sweetie Pie and he is welcome to stay with us for the remainder of his 9 Lives. You could be Sweetie Pie's angel and sponsor him for one month, six months, or a full year! JEN never tamed down. She is an office cat now.. You could be Jen's angel by sponsoring her care for a month, six months, or a whole year!.